Growing up, I enjoyed many a burger. I may not have had the appreciation for them that I do now, but I believed in the magic of McDonald’s, I had it my way at Burger King, and I let them treat me right at Dairy Queen. In fact, while visiting my parents in Indonesia last year, I was feeling a little nostalgic and dragged them to a nearby Burger King (I’m always amazed by the number and variety of American stores and restaurants that you can find overseas). We almost went to Carl’s Jr., but I really wanted to re-create the days when we were back in Houston and my parents would take me to our neighborhood BK. I got a Whopper……Jr. Don’t laugh!! It’s only my 4th post, and I already feel like I’m losing my reputation of being a BIG burger eater – ordering the smaller burger at Roaring Fork, not getting bacon on my burger at The Burger Custom Made, and now this…a Whopper…JR. I would try to explain myself, but I’m pretty sure I would just dig myself a bigger hole. 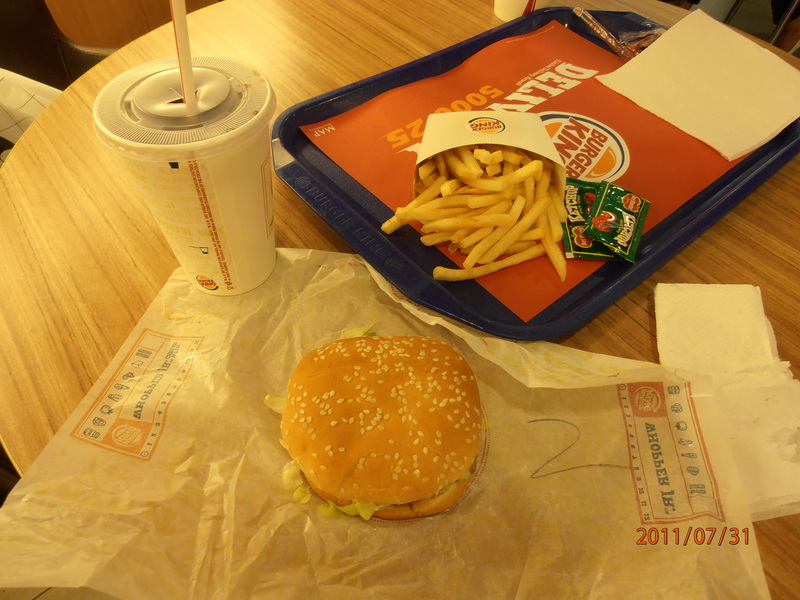 I always did love that flame-broiled taste of BK, and this Indonesian version did not disappoint. Sometimes a fast food burger is just what you want – inexpensive, quick, filling, you don’t even have to step out of your car to get it and for me, there’s the nostalgia. However, the star of my post today is a burger joint that wasn’t around when I was growing up. Opening its doors in 2002, Freddy’s Frozen Custard and Steakburgers is a rising star in the burger arena and not just the fast food division. In fact, it was one of the featured restaurants in Business Insider’s “8 ‘Better Burger’ Chains Poised to Conquer America” article. Better yet, it’s less than 10 minutes away from my house and less than 5 if I hit all the green lights! I really dig the ’50s style decor that they have inside the restaurant, but my wife and I almost always take advantage of the drive-thru and eat at home as the wife can’t handle the A/C that they’ve usually got blasting. 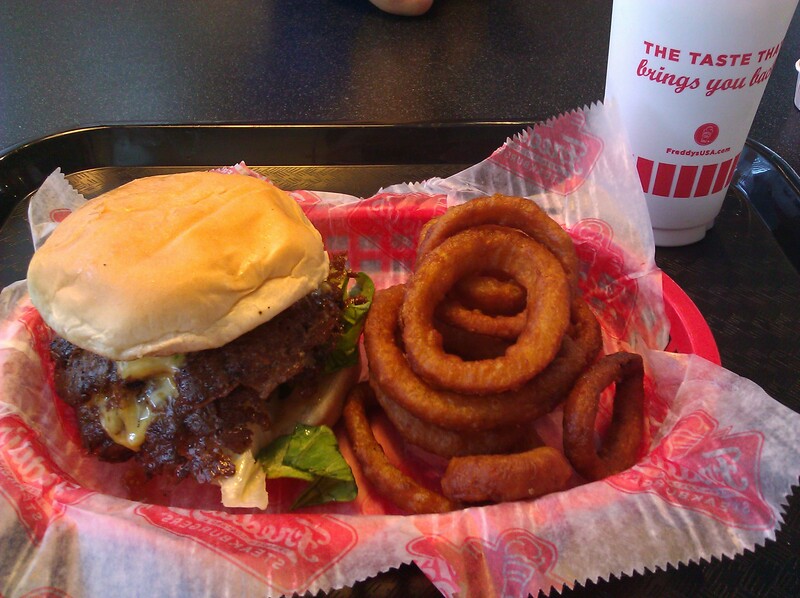 Freddy’s prides itself on their all beef patties, fresh veggies, and the fact that their burgers are cooked-to-order. I usually get the Double Steakburger California Style – just a fancy way of saying a double cheeseburger with all the veggies topped with Freddy’s Sauce (I swear it’s just thousand island dressing, but I’ll let them call it what they want to). The beef patties are thin but seasoned very well, and they have a nice crust to them. They serve a very thin cut French fry, but they’ve got good flavor and hold up well when dipped in ketchup, which is always a plus. Freddy’s also serves hot dogs, patty melts, and a number of other items. And it doesn’t hurt that their frozen custard is always a nice way to end off a meal. Yes its the nostalgia… Ours is at KFC, a place where our dad took us out to eat and we thought it was better than sitting at a fancy restaurant because we had each other.. Which reminds me i need to go back there recollect those lost memories. Thanks for the post! KFC brings back memories for me, too! Whenever my dad was at church and my mom didn’t feel like cooking, we’d pick up some KFC and eat it with rice and kimchi. Those were some good times. Thanks for reading my lil blog! !